Andrea Mantegna’s The Adoration of the Shepherds is more than a picture of herdsmen who have come to worship the newborn Christ child. This painting from New York’s Metropolitan Museum of Art educates the viewer in the means and ends of Christ-oriented devotion. Christ and the Virgin Mary are at the center of the painting’s composition. At the left we see Joseph and at the right the arriving shepherds. Through each of these figures Mantegna suggests a different dimension of faith. However, the success of his painting lies in Mantegna’s ability to unify the entire picture around the baby Jesus Christ. Looking across the painting, the first person we encounter is Joseph. Mantegna follows tradition in depicting him as a tired old man. This is to clarify that Joseph is not the baby’s father. Nevertheless, Mantegna depicts Joseph with a dignity befitting Mary’s husband and the Christ child’s protector. Contrary to what we might expect of a carpenter, Joseph wears the classical garments of a philosopher. Since Mantegna associated classical antiquity with the highest intellectual and moral characteristics, Joseph’s classical attire elevates him. At the composition’s other side the shepherds approach. Aware that they are encountering God incarnate, the shepherds’ hands are clasped in devotion. In contrast to Joseph’s nobility and the Virgin’s radiance, the shepherds appear rugged and earthy. Both the roughness of the shepherds’ features and the detail with which those features are depicted suggest the influence of Netherlandish art. Dressed in contemporary clothing, one shepherd wears a pale brown-green shirt and blue trousers. The other wears a red shirt under a blue jacket and lighter blue trousers. Compared to the bright crimson and yellow of Joseph’s garments, the shepherds’ clothes are a bit dull in coloring. However, their colors serve the purpose of making each shepherd’s movements and posture more clearly readable to the viewer. The tattered state of their clothing may be both a naturalistic depiction of their poverty as well as symbolic of their spiritual state. At the composition’s center the Virgin mother kneels before the Christ child. She wears a crimson robe and blue cloak. Her garments, in contrast to both those of the shepherds and Joseph, are highlighted with gold. The gold highlights visually designate Mary as being in a heavenly realm. The Virgin and Christ are surrounded by a host of red and gold cherubs. This is a means of visualizing their holiness and setting them apart. 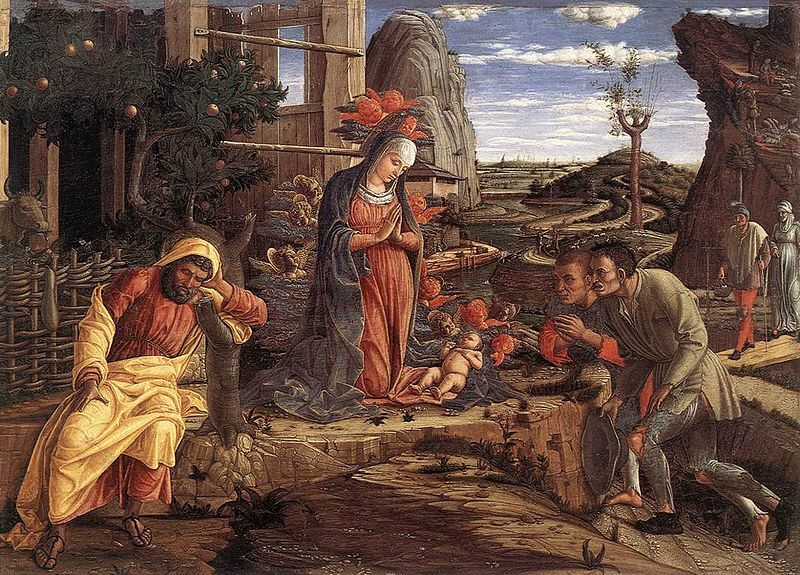 As a devotional narrative Mantegna’s The Adoration of the Shepherds may be read as suggesting three modes of knowledge or belief. Looking at the shepherds, Joseph and Mary, we see three distinct responses to Christ as the incarnation of God. The shepherds, their mouths agape, are in awe. They have belief without comprehension. Joseph, in a melancholic pose, evidences frustration. Having been visited by an angel and presumably a witness to the birth of a child whom he knows is not his own, Joseph comprehends these events but may not fully believe what he sees. In Mantegna’s painting only Mary has both knowledge and faith. A danger Mantegna faced in employing the shepherds, Joseph, and Mary as manifesting three distinct spiritual dispositions was that the painting might lack pictorial unity. Yet Mantegna was able to seamlessly hold them together. He achieved this, in part, through a triangular composition. Joseph leans to the right and the shepherds bend to the left. Mary, who has perfect posture, is at the apex of this composition. Her adoring gaze directs us to Christ. Mantegna’s The Adoration of the Shepherds is a narrative devotional painting in which there is a visual manifestation of a spiritual unity of every part of the painting, held together around and by Christ. Joseph, Mary and the shepherds are all positioned in relationship to Christ. Christ brings pictorial unity to the painting and brings unity to the world through his incarnation and passion. In The Adoration of the Shepherds the presence of heaven is palpable and directly connected to everyday experience. This harmony is a visualization of the significance of the incarnation. Andrea Mantegna: The Adoration of the Shepherds, shortly after 1450, tempera on canvas, transferred from wood, 37.8 x 53.3 cm. The Metropolitan Museum of Art, New York. Andrea Mantegna (c. 1431 – September 13, 1506) was an Italian painter, a student of Roman archeology, and son in law of Jacopo Bellini. One of the prodigies of Italian painting, he had already established his reputation by the age of eighteen. Like other artists of the time Mantegna experimented with perspective, e.g., by lowering the horizon in order to create a sense of greater monumentality. His flinty, metallic landscapes and somewhat stony figures give evidence of a fundamentally sculptural approach to painting. He also led a workshop that was the leading producer of prints in Venice before 1500.